Limited parking available, street parking available. Seating available for 10-30 guests. Menu selection of prix fixe, limited or full menu. Contact manager for details. 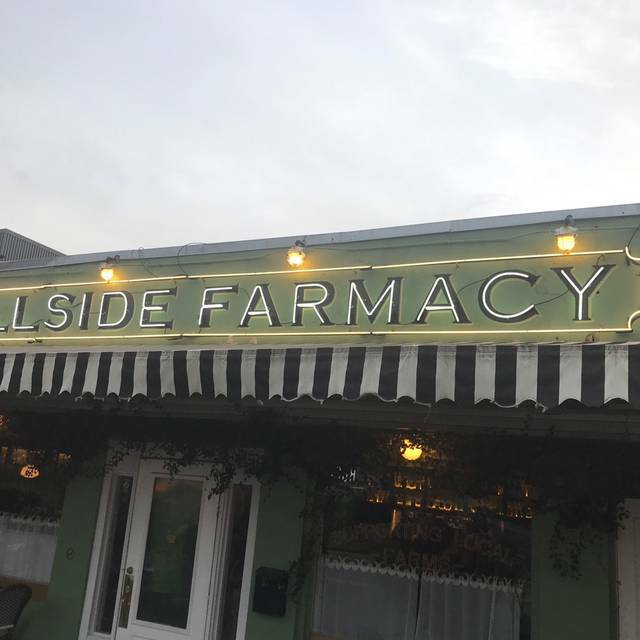 Hillside Farmacy is a restaurant and specialty grocery store located in the old Hillside Drugstore building beautifully restored using original pharmacy cabinetry. 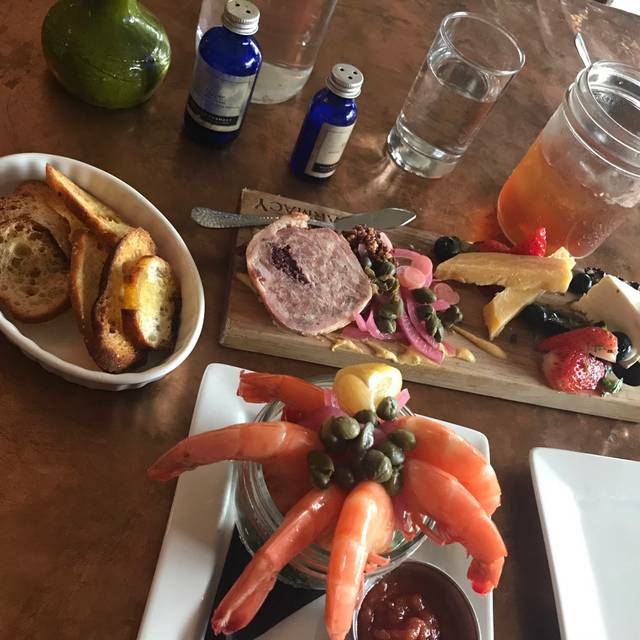 The menu consists of salads, sandwiches, cheese and charcuterie plates, oysters, new American style entrees and a full bar. The produce and meats served are purchased from the neighboring Eastside urban farms & Texas ranchers. Our eggs come from Happy Chick Farms a family owned and operated sustainable pasture-raised organic egg farm in Lockhart, TX. Their hens are humanely raised outdoors, enjoy! Hillside Farmacy is just as excellent as it is attractive. Very educated staff. Loved the recommendations that were offered and love when the server has a real pov vs riding the fence. Everything was fresh, delicious and very flavorful. Will definitely return and recommend. 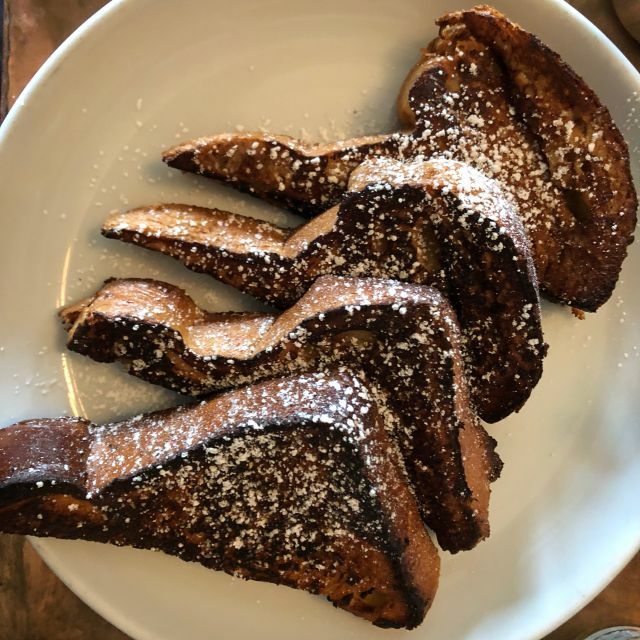 It was delightful, the French toast was yummy squared. A real treat on a Monday morning! 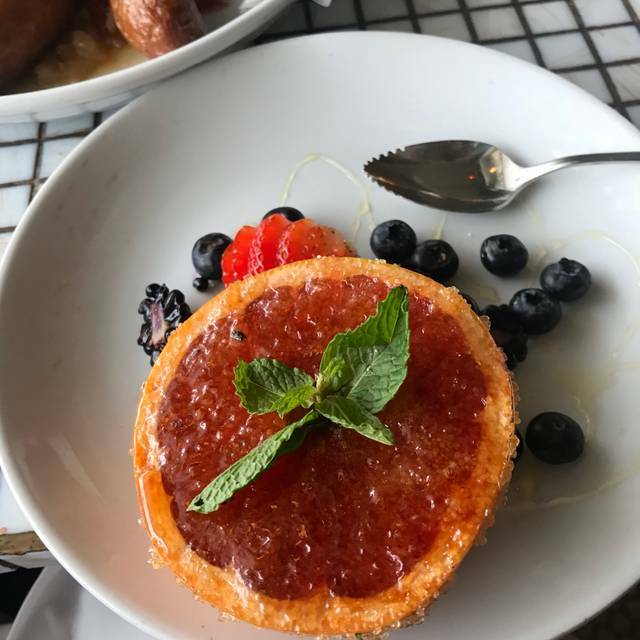 We had a picture perfect dining experience — the food was delicious, service was great and the noise level was perfect for dinner conversation with our friends. Can’t wait to go again! The chicken was unbelievable!! So glad I went with her recommendation. And reasonably priced for such incredible food!! Wonderful dinner experience. Had only been here for a drink in the past. The ambiance inside in the evening is very cozy and feels like you are in a bistro in Paris. Really enjoyed sitting in the beautifully decorated room--terrific ambiance to dine. We ordered a variety of dishes among the 3 of us--everything on the menu sounded delicious. Started with the butternut squash bisque, which was served in a clear glass jar with pea tendrils on top--so pretty, and delicious as well. This would be my only criticism--it took at least 20 minutes to get the soup. As soon as we were finished with the soup, all the other dishes came out---crab cakes, salad nicoise, grilled redfish with cauliflower mash, and grilled brussel sprouts. All delicious and beautifully presented! Too bad we had no room for dessert. I will definitely be back. This is now one of my new favorite restaurants in Austin! Brunch is great, but dinner was subpar across multiple dishes ordered. A great environment and celebration was largely spoiled by poor service. With prices like these, you hope for more attention from a server (at least like a “Hi, how are you?”), but this server was quick, awkward, and may have been an in one of those shows where they put someone who’s never done something in a new job and film it. You could have put her in any restaurant with any people and she wouldn’t have had to change the script because it was so sparse. When going out to celebrate an anniversary, you want it to feel special, but not the case here. I’ve felt more cared for at Chipotle and I mean that. Moreover, the steak was incredibly fatty (the actual meat was flavorful and I was happy with it, though). The fat was literally falling off of it and lumped into the fries. I thought one chunk of fat was a piece of garlic since it was completely off the steak and in the fries. I usually love this restaurant. Unfortunately, on a recent evening our service just wasn't up to par. Our waiter apparently failed to put our order in even though we told him that we had to be out by a certain time. It's too bad, because the food was really good, and the atmosphere is quite charming. The waiter did eventually take responsibility for the delay (without any notice during our wait though), and the restaurant did comp our wine. Wow the Texas steak was outstanding! I picked this restaurant based on menu and proximity to downtown concert we were attending later. I noticed they had keto friendly dishes. We were able to substitute the most delicious broccoli with garlic as well as greens for my hubby instead of standard yummy fries. I would definitely come back next time we are in town! Great atmosphere. Shocked that they didn’t have herbal teas. Best friggin' burger of my life. V rarely do i pride myself on consuming an entire plate of french fries AND a burger - but man, did i slam that meal. Felt so bad/so good after, I ran nine miles before bed. But that's another story. Ambiance and service were good but the food was a bit dull. The place seemed a bit worn out. The house salad needs to be more interesting....maybe some unique veggies, beets, croutons, etc. We ordered the ice cream sandwich. It wasn't very good at all! At the very minimum, the cookies should have been warmed before serving. The cookies tasted like they were 4 days old and they were very hard. We had to hammer away at it with the but of a knife to crack the cookies into crumbs. No fun. Salad greens wilted. Coffee not fresh. Entree was ok, not great . Very disappointed. Service was very good. Service was slow and lacking. Food was great and ambiance was cool. Very cute restaurant on the East side of Austin! We went for Valentine’s Day so were unaware of the set menu and the price was higher than anticipated, but still so good. My boyfriend got the “boneless bird” and was the best, juiciest chicken we’ve ever eaten. Cheese plate was delicious and filled with treats grown locally. Overall great experience! We were trying a new restaurant for Valentine’s Day, and happily stumbled on this gem. The food was excellent and the service matched it. Great ambiance. The only thing we didn’t care for was they had a Pre Fixe menu for Valentine’s. We would have liked to have tried some of their other dishes off of their standard menu, but I understand why restaurants do this. Overall, a great experience for a nice romantic evening. Food was inconsistent! Kale salad was barely washed and dressed. I had the Wild Boar and I received one piece that was over-cooked and too tough to eat; another piece was entirely raw and inedible. Husband’s Oxtail was overly salty and did not contain the gnocchi as the menu listed. This is a lovely restaurant but the portions were a bit skimpy given the entree descriptions. Neither my husband nor I have large appetites but it was disappointing to order the grilled chicken entree and receive a small piece sliced into thirds plus a wing section that was inedible. The broccoli side was fresh and flavorful, though. Our waiter was most attentive after delivering the check but this was probably an individual's character and not representative of the whole staff. I'd go again and give them the benefit of the doubt. Good but not great food. Kind of pricey for what you get. Limited food menu. Fantastic service. We went for dinner and ordered the grilled fish and steak entrees. The grilled fish was ok. The steak was a little undercooked in places and overcooked in others. A little strange (I ordered it medium-rare). We had the mac and cheese and brussel sprouts appetizers. The brussels were very good and the mac and cheese was decent. The main course, however, came out far too early (though our waitress poured me a free scotch to compensate a bit). A little overpriced for the quality of food and service. Service leaves little to be desired. Kids running around sliding all over the floor doesn’t match the $25 chicken price tag! First time visiting and it was a great first impression. Great place for a date with your loved one or with a group of friends. The place is unpretentious, quaint and charming. Their timing and execution of the details were worthy of coming back again and again. I really enjoyed the Texas Steak, Roasted Chicken, Mac N Cheese and Crispy Brussel Sprouts. Service was top notch. It was a perfect spot for my family birthday brunch. And everything and everyone was festive for the holidays. The food was amazzzzing. Delicious meal, great service and really cute restaurant. Close to great bars to make a night of it after dinner, but they also had delicious cocktails there! They were out of several menu items and substituted without even asking if okay or offering a discount. 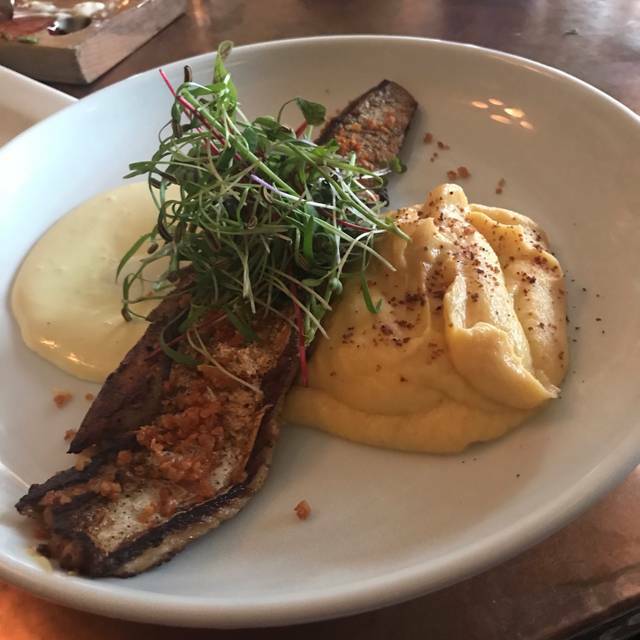 Newbies to experience Hillside Farmacy. We had early dinner reservations on a Sunday and thoroughly enjoyed our meal. 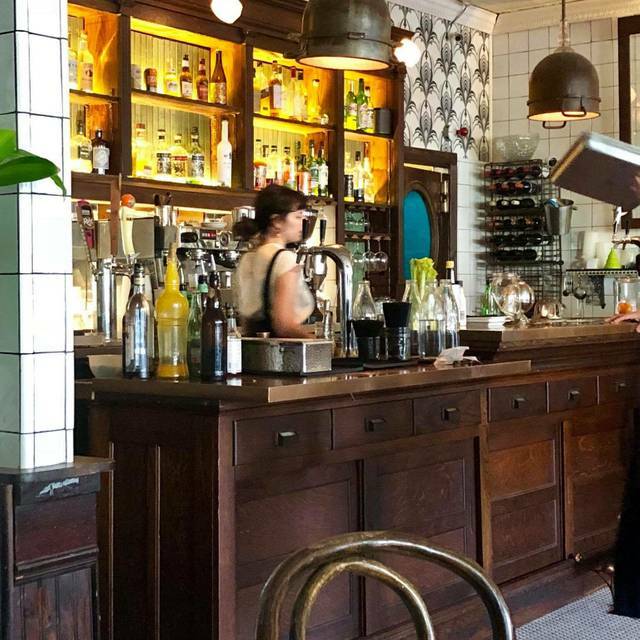 We read other reviews and photos and knew that the majority of the tables are cafe style, so we wanted a little more room and noted it in our reservations. When we arrived we were promptly greeted and shared that we had reservations. We were seated by the hostess at a cafe table, but were quickly relocated by a gentleman who said he saw our seating preference. Hillside Farmacy is an imitate restaurant with detail to decor— loved the history on the walls. Our waitress was very attentive and knowledgeable about the menu; she answered all of our questions. We had a wonderful meal. 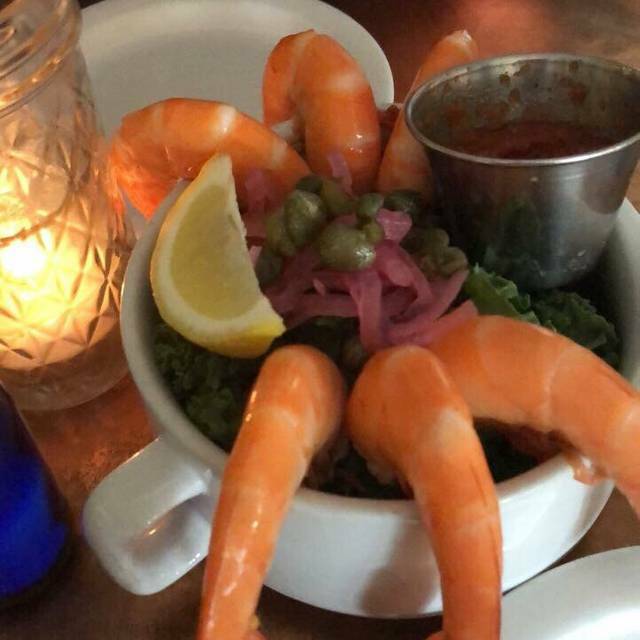 We started off with a shrimp cocktail and cheese plate appetizer. For our entree, we ordered chops and the fish — then topped it off with a cream brûlée. I must confess that my spouse is somewhat resistant to venture to the downtown area. However, I have been following Hillside Farmacy on Instagram and on Yelp and he followed my suggestion. We will be returning! 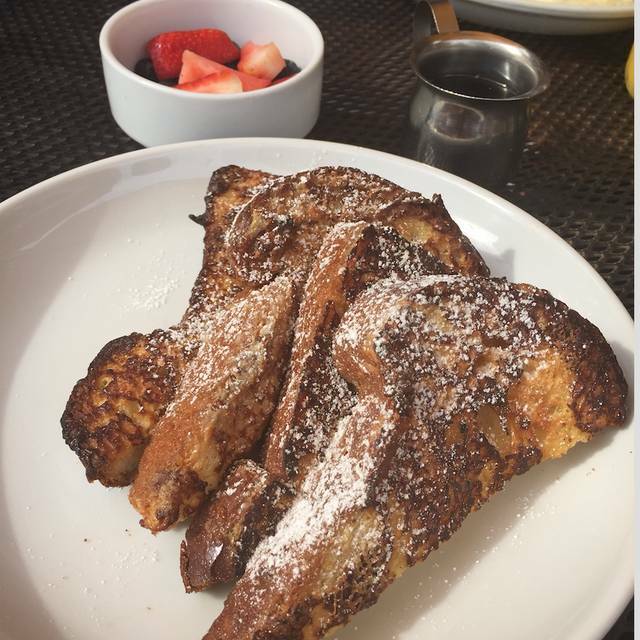 We really want to join brunch, but know it will be packed— great food, atmosphere and service. Food was amazing, out server was very attentive! This was a super cute restaurant but lacked value in food. Super small portions on the fish and cauliflower. My husband had the boar chops- unique but tough- in all fairness the server offered to not charge us which was super nice but it’s just not a worthy entree, although he did eat it as he knew it was wild game and could be a bit tough. Super small too tho. I had the niscoise salad and it was decent but not great. Pretty salty. REALLY wanted to give a better review as our server was so nice and the place is cute as can be. Worth a visit but we’d likely look for another option next time. The mac 'n' cheese was phenomenal. And, my boyfriend said the cheeseburger was one of the best he's ever had. I had the short ribs and they were very good! We also really enjoyed the farmacy plate. Kale salad was amazing as well as the messy cheeseburger! Always enjoy the decor of this farm-to-table gem. Service was good, food was great. I had the Nicoise salad with Gulf Black Drum. Fish was well seasoned and perfectly cooked, though a bit on the smaller side. Partner had the burger, which she thoroughly enjoyed, with malt fries. Those seemed a bit odd with a bit of sweetness, but well cooked. Drinks, both alcoholic and non, were refreshing and tasty. Only small complaint was that the gazpacho soup was not gluten-free. Our first time at this restaurant. The ambiance of this historic drugstore turned restaurant was great. The Tuesday @Adult Happy Meal”: burger wit fries and an Old Fashioned for $15 is a steal. They also have raw oysters. The menu is somewhat limited however. The cookie ice cream sandwich was a good way to finish the meal. Went there for the first time last week. Food was very good. Enjoyed sitting outside. Would have given it 5 stars except our service was not great. We had to go into the main restaurant twice to find our server. We told her we were in a hurry to get to a show and she did not come to take our order or deal with our bill in a timely manner. This was an amazing venue with a wonderful menu! Everything was tasty with great service. 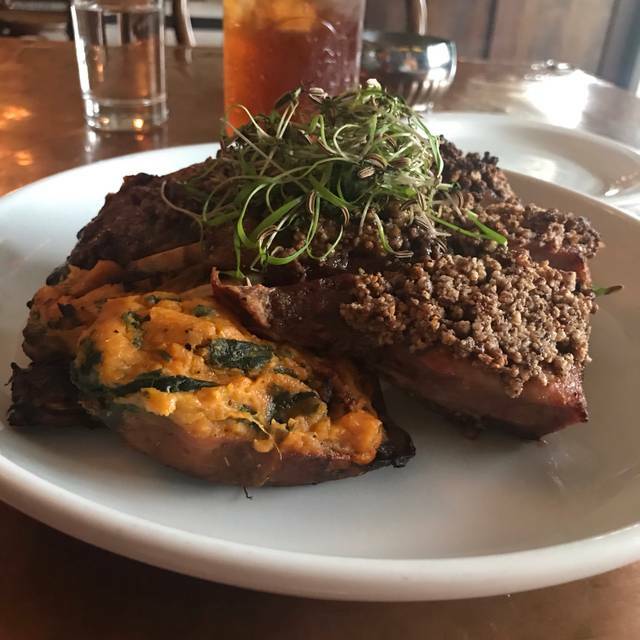 This was my first visit to the Farmacy and will definitely return and recommend to others!